GRID Alternatives North Coast leads teams of volunteers and job trainees to install solar electric systems for low-income families, providing families with needed savings and community members with hands-on training. Although active in the region since 2009, GRID launched a full-service North Coast Office in 2014 to better serve rural and Tribal families in this region. This was made possible thanks to a generous donation from an anonymous donor of the San Francisco Foundation. To date, we have made solar happen for over 250 families on the North Coast! Join us and be a part of the clean energy transition - become a client, volunteer, or partner today! GRID North Coast’s new short-term paid training opportunities can provide up to $300/day to qualified job seekers. For this month’s staff spotlight, we take you to our North Coast satellite office to meet Matt Wheeler! 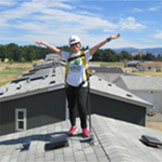 Enphase volunteers help GRID install solar on the Little Lake Grange community center in Willits, CA.